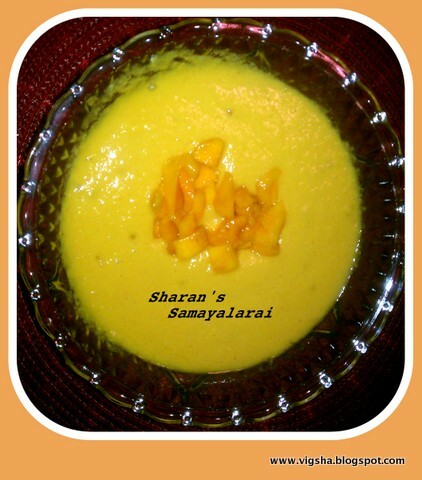 Mango payasam is a creamy fruity dessert. 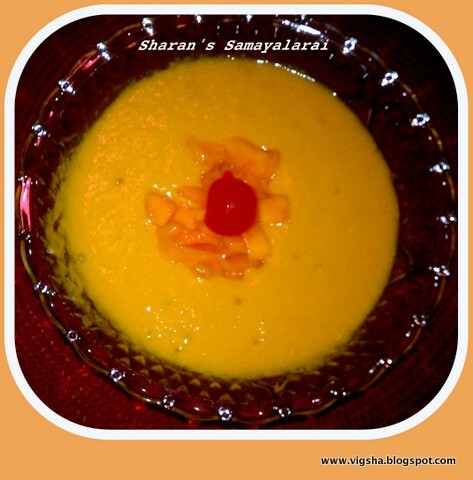 It is simple and heavenly, the feel of biting mango pieces in between the creamy smoothness of the payasam. This dessert is preapred by swirling in ripe mango pulp or puree into a mixture of sweetened condensed milk. 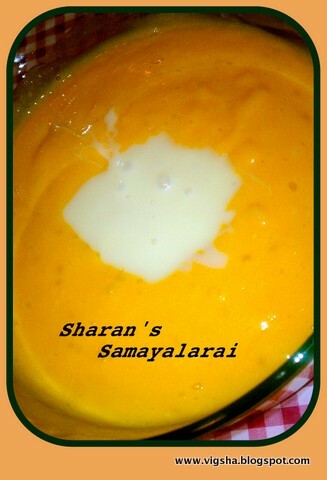 I decided to make a simple mango payasam for Aadi velli. 1). Boil the sago to translucent. 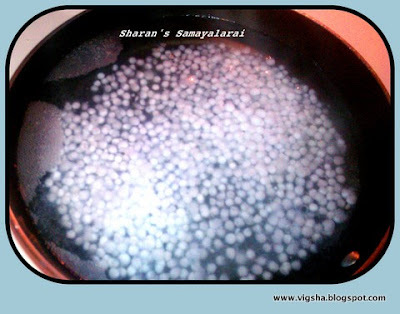 Put in the sago pearls when the water is boiling hot, in order to get clear looking sago in the end, stir once a while as the sago will stick to the bottom. 2). 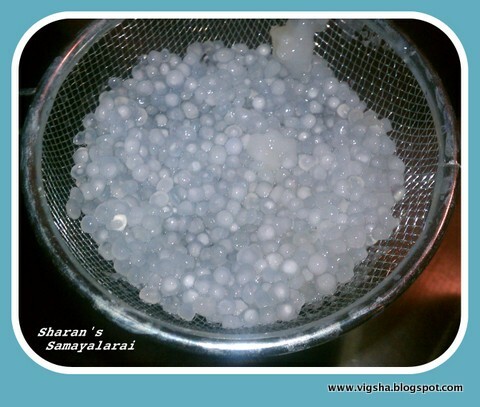 Once done, pour the sago into a colander and quickly run through with cold water to stop the cooking. Scoop the sago into a bowl. 3). Peel and cube mangoes. Blend the chopped mangoes with milk. 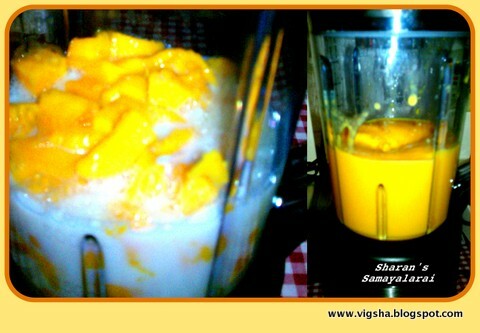 Then swirl the blended mangoes onto sago and mix well. Add the condensed milk in the sago-mango mixture and combine well. 4). Microwave for 3 minutes and top with chopped mangoes. Serve hot or cold. The smell and taste just lingers on. 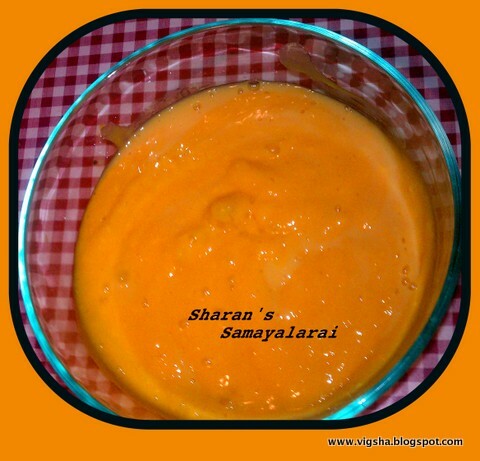 # I added a few pieces of ripe mangoes to the payasam for variety, it gives the feel of natural fruity sweetness and intensify the mango flavor. # Adjust the amount of milk according to consistency you want. # If you are serving cold, add half cup of milk and serve, as it will thicken later. # If you don't have condensed milk, just boil the regular milk till it reduces to half its volume and add sugar. # Quantity of sugar can be increased or decreased depending on the sweetness of the mango. # Can use ghee-fried cashews and raisins. You can add kesar (saffron) and Cardamom for making it more exotic! # Canned mango pulp can also be used. # Adjust the milk and sugar to suit your taste. Thanks so much for sending it to my event!